Eliminate all traces of hazardous natural gas in Oxygen Not Included. 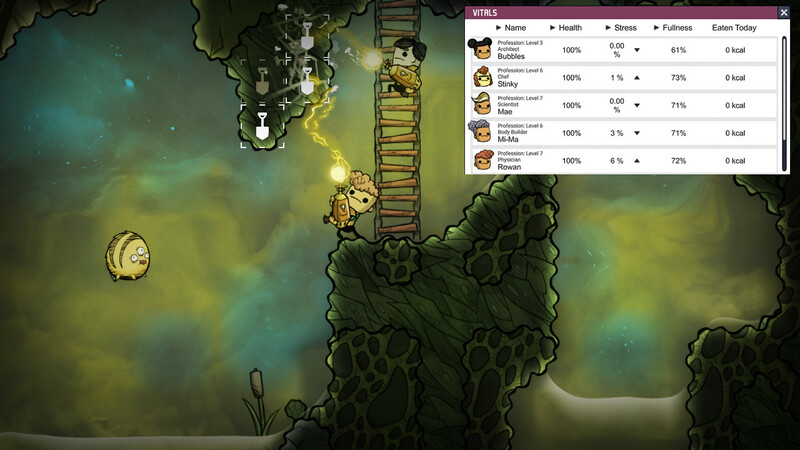 Carbon dioxide, hydrogen, chlorine… these are all natural gasses that you need to learn how to manage efficiently in Klei Entertainment's Oxygen Not Included. In this guide, we’ll be focusing on the most problematic gasses in ONI and ways you can prevent them from taking over. Remember—a well-planned and efficient gas management system works best if you’re trying to last long in this colony simulator. Make sure you’re hitting that pause button and carefully designing a sustainable colony before jumping right in. 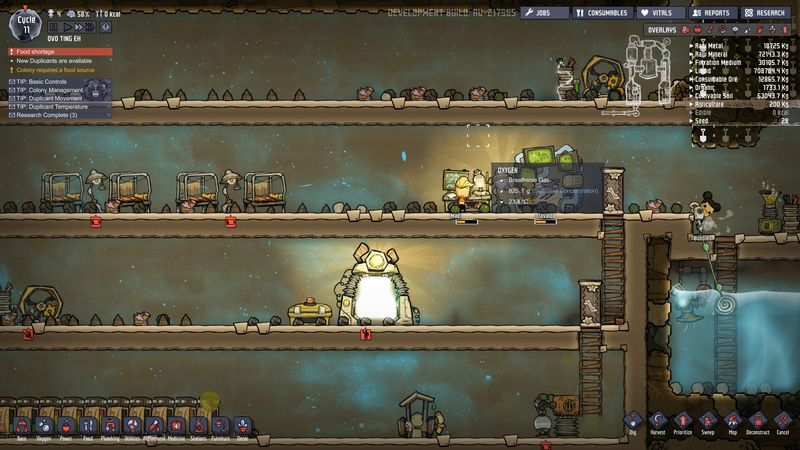 In Oxygen Not Included, your duplicates will quickly use up all the oxygen available in your colony and replace it with carbon dioxide. Knowing how to get more oxygen helps, but it doesn’t prevent the accumulation of this unbreathable natural gas. The first thing you should know in order to manage this natural gas is that carbon dioxide is heavy and settles below oxygen. If there isn’t enough oxygen to keep it at bay, then it will accumulate and take over. You can keep this issue at bay by making sure there are several levels to your colony. Next, you’ll need to do some research and unlock the Air Scrubber. This can be found under Liquid Piping > Percolation > Advanced Filtration in Research. This device uses water to rid the air around it of excess carbon dioxide and will produce polluted water in return. You can use a water purifier to filter the pollution out of the water and reuse it to minimize waste. You can also convert the carbon dioxide in your colony into a liquid or solid by using a Thermo Regulator and then store it. 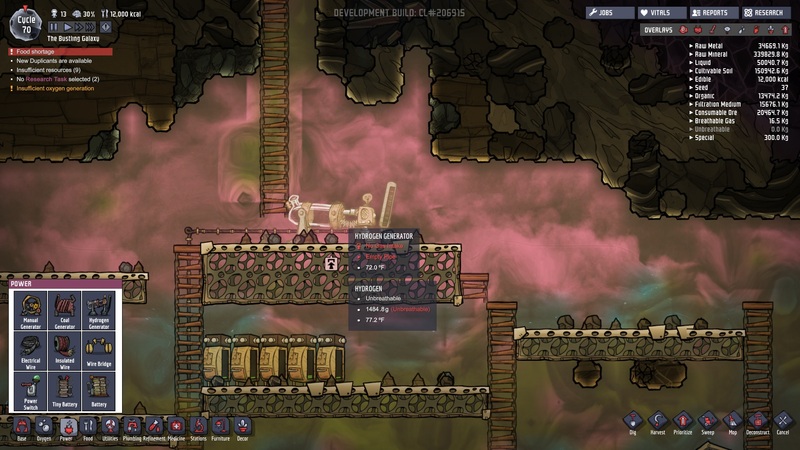 Polluted oxygen is unavoidable in Oxygen Not Included and generally shows up whenever there is polluted dirt, slime, or polluted water in the vicinity. Outhouses, Bio distillers, Composts and Air Scrubbers will also leave the area with contaminated oxygen. As you progress further along, you’ll realize that this is another important gas to manage. If its presence becomes too high, it can cause duplicates to become ill.
You can rid your colony of contaminated oxygen fairly easily with an Air Deodorizer. This can be found under Liquid Piping > Sanitation Sciences in Research. In order to work, this device requires a filtration medium (sand) to filter out the pollution from the air. This is extremely convenient at first as you’re expanding your colony, but once you start running low on resources, this might not be the best approach. An optional way of managing this natural gas is by using a Thermo Regulator to cool it and then convert it into heat. Hydrogen has a way of sneaking into your space colony. This is especially true if you're using use an Electrolyzer to produce oxygen. Since hydrogen is the lightest of all the natural gasses in Oxygen Not Included, it will settle at the top with a pinkish hue. It's important to remove Hydrogen as soon as you start to notice its presence because it's an unbreathable gas that lowers the temperature. You can easily remove it by using a Hydrogen Generator. These handy devices use gas pumps to take in the hydrogen and turn it into energy that you can use for other machines. You can unlock the Hydrogen Generator by researching Power Regulation > Combustion > Performance Combustion. We suggest setting up any Electrolyzers and Hydrogen Generators in a seperate room where you can direct the hydrogen without having to worry about contaminating the colony. Natural gas is another type of resource that you will encounter in Oxygen Not Included. This unbreathable gas can pose an issue if it has a large presence in your colony. Its a common byproduct of the fertilizer maker, duplicates with the flatulance trait, or the natural gas geysers that were introduced in the recent Agriculture Update. It can be slightly more problematic than hydrogen because its weight falls between oxygen and carbon dioxide. That being said, it can be removed using a Natural Gas Generator which converts it into electricity. This device is unlockable by researching Power Regulation > Combustion > Performance Combustion. We hope this helped you on your journey to a sustainable colony and if you found this article helpful then check out our tips for beginners and our guide for dealing with stress in Oxygen Not Included.